HOW IMPORTANT ARE YOUR FINANCES? A household budget sounds so “old school” especially with all the new technology we have today but it’s not. Not much has changed with the household budget apart from the ability to use other forms of budget tracking rather than paper and a pencil. Even so, many people continue to track their household budget the easy way because it’s something they are used to doing. Let’s remember that for further down the post. “It’s something they are used to doing”. Learning how to manage your finances can be as complicated or easy as you want to make it. Everyone has a unique financial situation which may take little to no effort at all or lots of undertaking. Your household budget may be weekly or monthly like ours and at first it seems like a huge chore and it is but over time once you start to see the benefit (and you will). Then, you might never want to let it go even after you pay off all of your debts. There is some sort of an emotional attachment to the household budget every month comparable to wanting to eat healthy, exercise and be happy for us. Call us strange but this is the way we roll. When you decide to keep track of spending habits and your overall financial health you’ve taken control of what some people shove under the carpet until it’s too late. Then it becomes an even bigger problem when a few minutes a day of organized financial chaos might have solved the problem with a household budget. Don’t be that person who waits until it’s too late. It’s not worth the hassle. No one is ever going to be free from some form of debt whether it’s a monthly bill or large amounts of debt because we have to pay to survive on this earth. However you chose to keep track of your bills will ultimately either assist you in succeeding with money or failing miserably. Remember, not everyone NEEDS to use a budget BUT if you can’t get out of debt then you probably should think about using one. Last month when I blogged about being one year mortgage free a fan sent me a message asking me a question that I thought eventually someone would ask. May I ask why you continue to budget if you have no debt and no mortgage? I mean no disrespect at all because I think what you have both done at a young age is amazing. I guess we all hope there is a light at the end of the tunnel where we can pack in the budget and get rid of it for good. Thanks for your question Tina and you know Mrs. CBB and I have talked about this before. It was just after we paid the mortgage off and we were running budget numbers for the month. My wife asked if we should ever stop budgeting and just watch our spending. I knew that we could do that because that is how we used to track our expenses before the budget came along. The problem with that was we weren’t saving enough, we didn’t know where the money went and it was SO easy to spend more than we thought we were. Keep in mind we were always a frugal couple so we weren’t off spending money we didn’t have. It was all those little expenses that would add up particularly in the grocery budget. We talked about just tracking our grocery expenses because that was our worst budget category. Essentially we could use the envelope budgeting system and carry cash with us when we went to the grocery store. Sure, it sounds great BUT it’s just not something we follow through with. I always suggest to the fans that they need to find something that they will stick with. If you don’t you are only bound to fail. Lots of people LOVE using cash to track their household budget but we’re not that couple. It seemed like an easy way out of tracking the monthly household budget but in the end we decided that we’d feel financially naked without seeing our monthly figures. It’s something we are used to doing like I mentioned above and although change can be good for us our finances seem to thrive the best with our household budget. The household budget is our pat on the back every month for a job well done. You can choose how a budget will affect you emotionally but this is what it has done for us. Since most people don’t go out of their way to disclose their finances with just anyone most times they are alone when it comes to debt and financial obligations. It can be a scary place for some people who don’t know who to turn to for help when the going gets tough. The household budget has in some way become an online budgeting pal who tells us whether we are on track financially or whether we need to smarten up. We believe that if we were to get rid of the household budget altogether we’d miss out on that motivational push that the budget gives us every month. We have learned not so much from experience but from those around us and media reports that just because someone has lots of money or no debt doesn’t mean that financial trouble won’t haunt them. It happens and these people lose everything including the shirts off their back. They thought they were safe from the financial devil himself!! No one is ever safe. Money can leave out the door just as easily as it arrived so don’t be a fool with your finances. Always stay one step ahead so that’s what we are doing. If that means you budget every month until you no longer can then do so. It’s up to you how you decide to get that ongoing financial motivation that we all need. We are by far millionaires and even then a million dollars is peanuts these days. You can read all the money saving tips you want but if you don’t put them to good use and have some understanding about how they are benefiting you then it becomes just something you read. When would you stop using a household budget? With the Property Taxes due and extra spending in the garden and other projects around the house the money sure disappeared quick this month. The outside lighting is completed although it cost a little more than I thought it was going to but at least it’s done properly. The outside faucet located in the garage also got replaced as the water was leaking through the valve handle. I replaced it with a more expensive frost-free outside faucet so now I don’t have to turn off the water supply for outside in the winter and insulate it. The weed barrier went in on the back garden and then mulch. We bought the more expensive 25 year + weed barrier just so we don’t have to keep replacing it. The lawn was also string lined and cut straight at the borders and edging installed that is below the deck height of the lawnmower. I can now cut the lawn better, quicker and trim the edges straighter on a more consistent basis. Not having to weed will cut down on time spent doing chores and more time spent with the family. At the front of the house we’ve had weed barrier in now for 2 years and not a single weed. It takes about 10 minutes to cut and trim the front lawn and it looks fantastic every time. Now I can see the benefits of paying out the money in the first place. Sometimes you just have to pay the extra to get the job done properly. I’m currently offering 2 versions of our budget and the reason behind it is simple. Firstly, read the CBB blog disclaimer because what you do with it is your own business so if you mess it up you need to sort that out. Although I would love to help every single fan with their budget I am unable to do so but I am always willing to answer any emails you send me so don’t be shy. This was after all meant to be our personal budget and although I would love to customize it for every fan that wants to use it but, I’m afraid I cannot. I’m not selling this budget or hope to make any money from it so enjoy this free budget and I hope that it works for you as much as it does for us. You can download the free budget spreadsheets here. Budget 1– You can use the pre-existing categories or you can use your own if you wish and you have the option to use projected expenses or not. Please read all notes left around the budget for tips. Budget 2-Everything is pre-set so you have to use the pre-defined categories but this budget will generate year-end budget figures where the other one won’t but you must use the categories already in this budget. If you change anything you will mess up the formulas and year-end figures. Please read all notes left around the budget for tips. I’m always open to feedback but be polite as you don’t want to hurt my feelings Test it out for a month and see how it goes. There is never any harm in trying something new. How we budget our monthly expenses? I often have fans ask me how to budget money on a low-income or they simply a high debt load and want to kill it like my friend Tony who got rid of over $100,000 worth of debt by using a budget. CBB fans want to know what we do in order to save so much money and the reply I give is simple>> It’s not about the money it’s about the process involved. We are both money managers of our finances and with our relationship compatibility we have been able to get to where we are in 2015, debt free. It doesn’t matter if you are using a cash only budget or you use your debit and credit cards, if your budget doesn’t balance you have budget issues you should review it pronto. Learning how to be your own money manager is important because no one else will care about your money more than YOU!. We don’t always save as much money as we would like every month but most importantly we are not going into debt but only because we are budgeting our money. In fact we are currently debt-free including the mortgage which means all we pay for is our monthly bills and expenses. One of the most important things we did for our personal finances was that we never let the budget deter us from reaching our goals. Sure we’ve had crap months but we’ve made up for it or we learned from our mistakes just like we should. Budget failure only occurs when you give up on your budget which should not happen as long as you truly want to reach your goals. We didn’t always earn the income we do today but made do with what we were earning so we didn’t go into debt. That my friends is called “living below your means”. The only science to becoming rich! Sometimes fans email and ask me if living on a budget in Canada is any different from living and budgeting in other countries. To be honest I’m going to say, probably not. If I still lived in the UK I could use this exact budget spreadsheet to meet all of my needs however the budget needs to be reviewed monthly. Below are links to the budgeting series which I wrote while designing our excel budget spreadsheet which will give you an idea just how we designed our budget. I’m not a financial planner/advisor so I can’t tell you how you should budget but I can show you how we budget our numbers. I’m just a regular guy just like everyone else; some might call me a budget or numbers nerd. Do you want to learn to budget like we do? We explain everything we do and more in this mini-series all about budgeting. Please take the time to read through our budgeting series plus read Budgeting in the New Year. I hope the information will help stop you from making common budgeting mistakes that I hear of often and that you take something away from the information and apply it to your financial situation. If you have any questions about what we do with our money tracker ie: The budget than feel free to email me. I may expand more on the topics as we go along and add some mini-series in 2015 detailing how we budget to break it down even further for you. How We Designed Our Budget Step 6– Who Does What and When? Our savings of 24.93% includes savings and investments and emergency savings for this month. The monthly totals comes to 100% which shows that we spent our income this month and used the rest as emergency savings. The other categories were well within the defined percentage limits. Our projected expenses this month is at 21.69%. This is simply a breakdown of our expenses which has helped us to understand where all of our money goes. As of May 2014 we are mortgage free so much of our money will be directed at savings, investments and renovations. I appreciate that you enjoy this budget update each month but I do hope you view this as an educational tool rather than comparing your own financial numbers as our situations are all unique. Although I encourage your comments and love to hear what you have to say about our budget categories and expenses please don’t tell us to donate our money to charities because we have too much or are fortunate. We are hardly out of the clear with finances for the rest of our lives and have worked and sacrificed to get where we are. We do plan to enjoy the money we’ve saved now since we haven’t over the years with our son. What we do with our “extra cash” is our business and although we do donate to a charity we won’t be putting it on display for the world to see as it defeats the purpose in my eyes. It is part of the budget as you see it. I hope that clears that up for those of you who had concerns about our extra money. Almost 7 years ago I started working in Canada making a bit over minimum wage and have since moved up the ladder. I’m now working very hard to secure my dream job with one foot in the door. We aren’t all lucky but if you do the best you can at least you can look back and say you gave it a shot. Sometimes we wish we had more money to budget with but understand that we only have what we earn and if we want more, we need to earn more. Spending less than we earn and budgeting our money has been the easiest way for us to pay down debt and save money. Chequing– This is the bank account where all of our debt gets paid from. Emergency Savings Account– This is a high-interest savings account. Regular Savings Account– This is a savings account that holds our projected expenses. What are Projected Expenses? – We project expenses throughout the year so we have the money saved. PE= A projected expense is money automatically saved each month so it is ready when the bill comes in or when you need it as in the example below. We review our projected expenses at the beginning of the year to set up our yearly budget and adjust as we go along if a new projected expense arises and needs to be added to the budget. Sometimes we remove a projected expense as well so it’s very important to keep an eye on your expenses. This has happened on many occasions but it’s bound to happen as we can’t predict everything we have to pay for over the course of the year. The important part for us is that we are saving for these expenses and we no longer have to stress about taking money from our savings to pay for them. To learn more about projected expenses read Step 10 in my budgeting series. When we spend the money in a projected expense category we move that money to our chequing account in order to pay for that incoming expense. So this means the numbers go up and down in the projected expenses account based on what we need to pay for that we saved for in the account over time. The only thing you need to do is track your projected expenses each month manually as I can’t customize that for you in the excel budget spreadsheet as I don’t know what you will use for projected expenses. For now we will have to manually track which means month after month we add up what we save in each projected expense category and minus what we spend so we know how much we have and what is left in each category. I have updated our personal excel budget spreadsheet for 2015. We pay money into the projected expenses account continually throughout the year even when bills come due as its revolving so as one bill gets paid the money continues to come in from the other categories all year-long. This ensures that money is always available. It may not always be enough but having something ready is better than having nothing at all and having to use credit. So the $1766.35 gets paid into the projected expense account every month no matter what. It seems to be easier to track our money this way but you can do what works best for you. If our clothing category was a projected expense we have a budget of $50 per month for the two of us. If we spend $30 on clothes for the month that means we need to pull $30 from the projected expenses account to pay for this expense or we move only $20 to projected expenses for the month and leave the $30 in your chequing account. It’s up to you how you do it as I mentioned above. I’m hoping to put together a projected expenses spreadsheet to track the expenses all year-long otherwise you need to do that to make sure you don’t overspend what you haven’t saved or will save over the course of the year. It’s a fairly easy process and becomes a lifestyle change for your finances but the most important part is that the money is available and saved, which means potentially less stress. This means we should have $600.00 per year for clothing to spend. We have to track that expense as we spend it manually but hopefully for our 2015 budget I can incorporate that into our spreadsheet so it tallies the numbers up as we go along. That way we will be able to know exactly what we’ve spent as an ongoing total. Below you will see two tables, one is our monthly budget and the other is our actual budget for the month of June 2015. This budget represents 2 adults and a baby plus all of our investments. If it is highlighted in blue that means it is a projected expense of ours. You will also see our budget does not include the emergency savings as this is factored in at the end. Install garden lighting- Completed Yes! Reach 4350 Twitter Followers- Completed Yes! Reach 6555 Facebook Followers- Completed Yes! Reach 2070 Pinterest Followers- Completed Yes! Reach 3100 Followers The Free Recipe Depot Facebook- Nope, Fail! Reach 171 Followers Bloglovin- Completed Yes! Finish the budget projected expenses- Nope, Fail! Help a new blogger with a task or question- Of course I did 🙂 Yes! Connect with a new blogger- A few this month Yes! Finish the bathroom shower- Nope, Fail! Pick out new tiles for bathroom and accessories (mirror, towel bar holder etc. )- Nope Fail! Buy remainder of bathroom renovation materials- Nope, Fail! Buy a new blind for the garage- Nope Fail! Finish the walls in the baby room- Nope Fail! Research and get quotes for a new fence and gulp… talk to the neighbours about pitching in some cash- Nope, Fail! Install weed barrier, river rock and mulch in back garden- Completed Yes! I’d say that I had a very successful month with the blog and completing tasks around the house. I only have a short time left before I head back to my second job so I really need to pick up the pace. In case you missed our budget updates and want to do a quick search I’ve compiled them all on one handy page: monthly budgets. 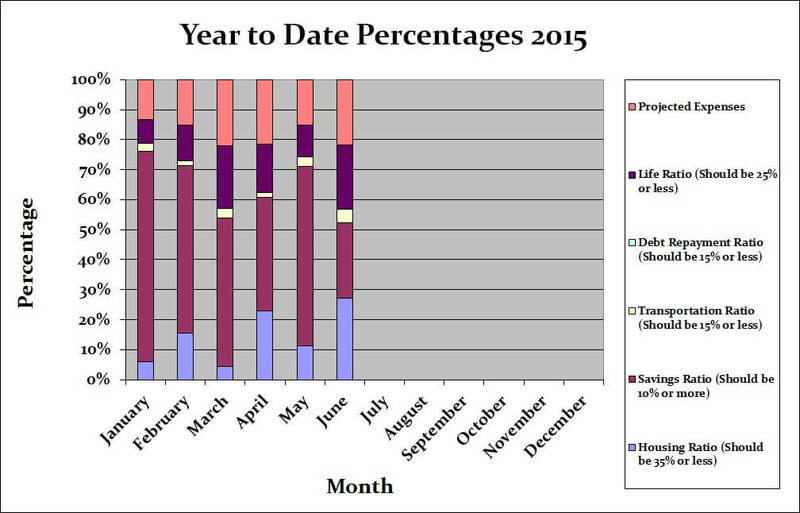 For the 2015 Year I will also keep track of each month just below. I will start the list off with our end of year budget update from 2014 just in case you missed it. 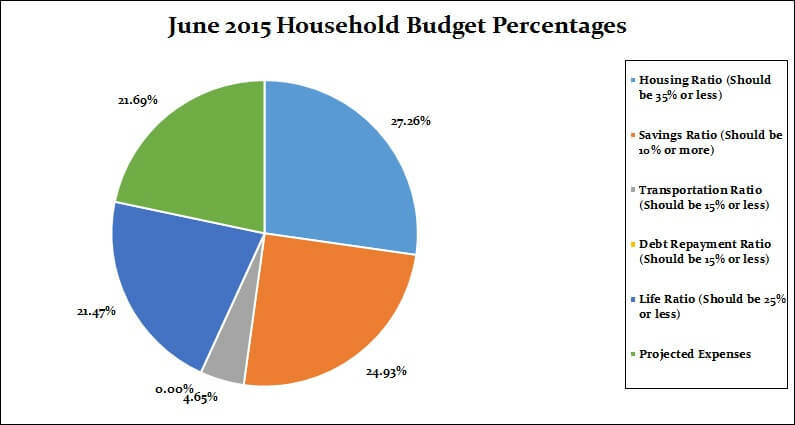 That’s all for this month check back at the beginning of August 2015 to see how we made out with our July 2015 budget! For me budgeting is part of life. It’s like we started the hobby of budgeting. Once we stop doing it, it’s like something is missing and we keep looking for it. This results in wondering where the money goes. Thus, budgeting is a weekly task at the most I and my wife do. Exactly the way we feel. We would feel a loss of balance if we stopped budgeting. I can see how you might get a little less strict with your budget as you get out of debt (I know you already are, I’m talking in general), but I don’t think I’d want to stop budgeting or tracking expenses altogether. Interesting question and info. No, stopping the budget is really just a recipe for disaster. It’s like those people who win the lottery and think they are safe for life financially until they claim bankruptcy. This is such a great post, for me if ever I don’t have any debt and no mortgage I would still continue to stick to my budget. I’m looking forward to be debt free in the future, BUT still I want to keep track of my spending and income as well as my investment. Good for you Clarrise. It has really helps us out. Not using a budget is how people loose track of their money & get in trouble. Wiser. Easier to get to where you want to be with a map.